Smoking was fashionable during the 19th century, and like all fashionable pastimes there was a strict code of smoking etiquette. Gentlemen did not smoke in female company, which is why often retired smoking rooms after dinner. Smoking by ladies was still frowned upon, although members of the working classes used snuff and smoked clay pipes. The pure form of nicotine was discovered in 1826 and there were almost instantaneous and widespread fears of addiction. 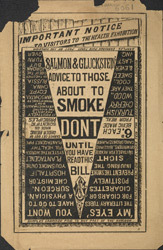 This leaflet promises that using a Salmon & Gluckstein pipe "positively prevents the nicotine entering the mouth".